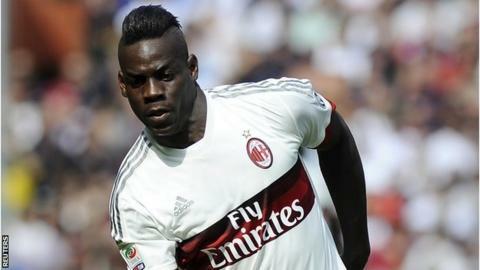 AC Milan striker Mario Balotelli will be out for a further four weeks after having surgery on a groin injury. The 25-year-old, on a season loan from Liverpool, has not played for the Italian club since 27 September having had treatment to remedy the problem. After the surgery, the Italy forward wrote on Instagram: "All done! All good! Coming back soon." Balotelli has made just four Serie A appearances in his second spell at Milan, and has scored one goal. The Serie A club stated: "The operation was technically successful and the recovery time is around four weeks, assuming there are no complications." The Italian giants, coached by Sinisa Mihajlovic, are in sixth place in the league. Mario Balotelli on Instagram: "All done! All good! Coming back soon. Thanks for the support and I'll be back"